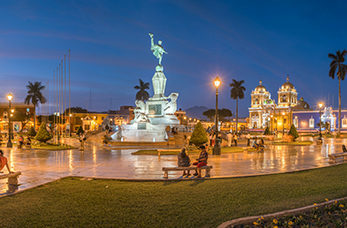 Trujillo is a city that is situated on the north-western coast of Peru and is the third most populous city in the country. The city still has its original polychrome buildings and variety of colonial churches along the stretch of the city. The centre of the city holds a big shopping complex where you can shop and browse stores all day long. Trujillo is a place where you can relax and take in the beautiful scenery and that’s why it’s a popular tourist destination. This cathedral was constructed in 1735 and is known to be the best preserved cathedral in Trujillo. The interior and exterior are just magnificent and the gateway entrance is around 300 years old. This cathedral still holds services but not very often as it's a historic site in the city. This building was named after a former president of Peru. It was built in 18th century and inside has a collection of vintage furnishings from the first owner of this building. The site is due for some renovations to make a more modern but still hopes to keep some of the original interior.